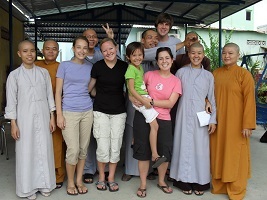 Our teaching programs abroad place volunteers at schools, community organizations and Buddhist monasteries. 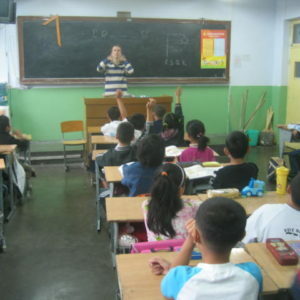 Volunteers primarily teach English but also math, physics, art and music. 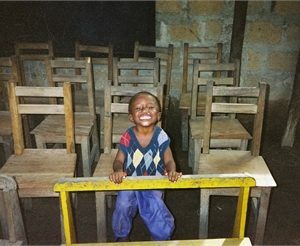 The students range from kindergarteners in Ghana to teens in Guatemala to monks in Vietnam. You do not need to be a certified teacher or a native speaker of English to join our teaching programs abroad. The focus is on practicing conversational English. Volunteers receive assistance from local teachers on lesson plans and the overall curriculum. Volunteers can also bring their own teaching materials such as picture books, instruments, flash cards, art supplies, and worksheets. The students our volunteers work with rarely get to learn from fluent speakers English. Our teaching programs abroad are a unique opportunity to share your language skills and to serve as a mentor to students and teachers alike.